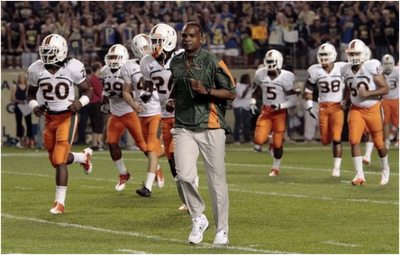 CORAL GABLES – Miami Hurricanes players found a surprise in their lockers Monday when they arrived for a team workout. It was a postcard from former coach Randy Shannon. One side had “U” printed on it. On the other side, there was a handwritten note from Shannon personalized for each player. Some of the players got their postcard from Shannon, who was fired hours after the final regular season game Nov. 27, on Friday. CB Ryan Hill, a fifth-year senior, said he was surprised to find his postcard. “It was great to know that’s what he thought of me,” junior C Tyler Horn said. Hill said he had already spoken to Shannon on the phone and planned to call him again later Monday. “I’m going to ask him why he did it because I don’t need this sad stuff anymore,” Hill said with a smile.